While many Indians are criticising the actor, Pakistan is all praises for him. BOOM finds that the video is old and not after the Pulwama attacks. A short clip of an old video of actor Akshay Kumar where he is heard talking about Pakistan has resurfaced on social media, with a misleading caption that the actor is being ‘unsympathetic’ towards the soldiers who died in the February 14 terror attack in Pulwama. The 23-second video is from a longer video shot in 2015 when the actor was speaking to media persons during the premiere of his film ‘Baby’. Kumar can be heard explaining why terrorism cannot be linked with Pakistan alone. The video is viral in Pakistan with the narrative of how a sane Indian voice has finally emerged. In fact, a Pakistani news channel ran an entire bulletin on the video too. You can view the archived link here. The video has been culled from a longer video of Akshay Kumar’s press interaction at the premiere of his 2015’s film Baby. At the 5.38 minute mark, Kumar can be seen addressing the terrorism in Pakistan question. Kumar dodged the question and said, “They can give you the answer, I don’t know about it. I have no idea, I don’t even know whether it is banned or not.” Baby was in fact banned in Pakistan after the Pakistan Censor Board refused to allow its screening. The cropped 22-second video has been received differently in the neighbouring nations India and Pakistan, after the Pulwama terror attacks. 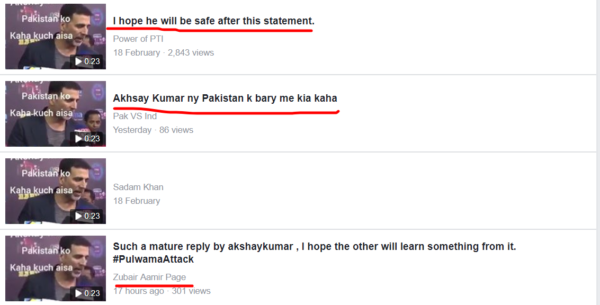 Several users from India have accused Kumar of being ‘pro-Pakistan’ and denying any involvement of the nation in terror attacks in the wake of the Pulwama massacre. 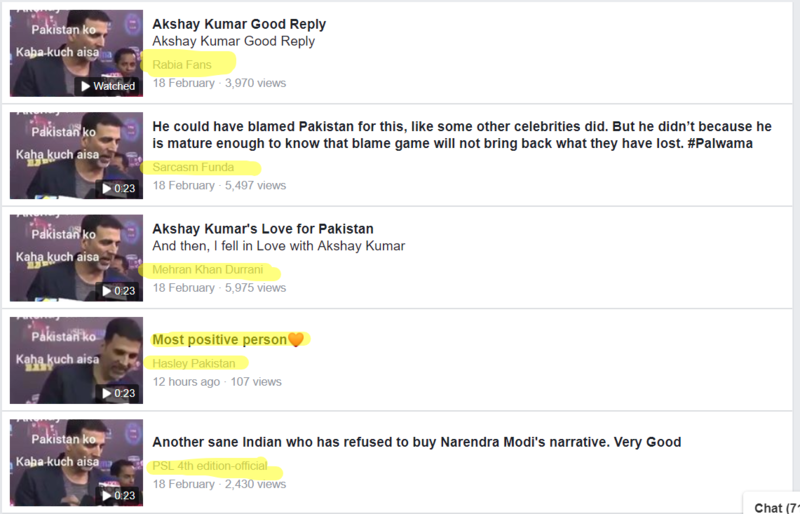 Meanwhile, multiple Pakistani users on Facebook have praised Kumar for being one ‘sane Indian voice’ amidst all the ‘hatred’ being generated for their country from India. Pakistanis have posted the video with praises doubling up as captions for Kumar. A user even raised questions of Kumar’s safety after such a statement. Pakistani users’ captions and descriptions are marked in yellow. Mehran Khan Durrani’s, a special branch police trainer from Karachi, Pakistan, post can be viewed below. 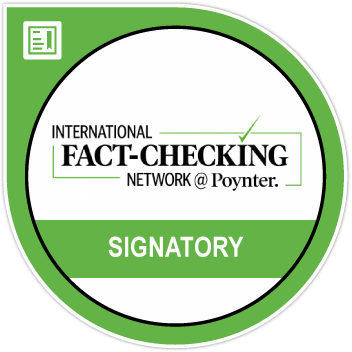 However, Indians claim that the statement is in bad taste.